Get noticed effectively, easily and affordably. The Jupiter 41 is easy to use and carry because of simple design and compact size. 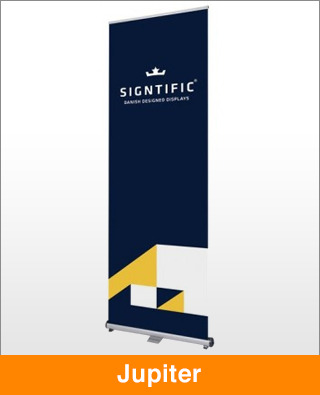 Discreet styling will get your banners noticed giving a professional finish to your display. The patented design has a stable base and a twist lock telescopic pole, which extends to 2.4m, plus interchangeable cartridges means graphics can be changed in seconds.